After looking at the diorama from the movie Goldfinger, it’s time once again to return to the world of James Bond. Diamonds are Forever (1971) takes Bond to Las Vegas, where a diamond smuggling investigation puts him in the middle of a plot involving satellites, high energy lasers, and his arch nemesis Ernst Stavro Blofeld. High above Las Vegas is the lavish penthouse of billionaire industrialist Willard Whyte. 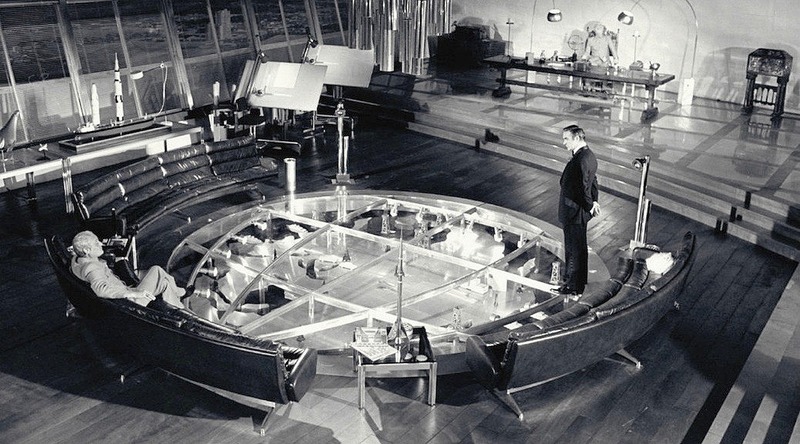 The most distinctive feature of this Ken Adam designed set is the floor, which has a circular glass inset containing a diorama of Whyte’s worldwide business enterprises. Several meters in diameter, the disk-shaped diorama is surrounded by three curved couches which hug its perimeter, accentuating the circular motif. The diorama goes a step beyond the one in Goldfinger by virtue of its glass roof, which is flush with the floor and is supported by a gleaming metal lattice. The shape of the lattice mimics the latitude and longitude lines on a world map. Auric Golfinger’s cleaning lady would have had her work cut out for her dusting the massive diorama of Fort Knox. The reclusive Whyte, who abhors intrusions into his private lair, wisely decided to cover his diorama with glass, keeping it permanently dust-free without the need for outside help. If you read my previous post on keeping dust off your diorama, you’ll appreciate the eminent practicality of this design. The other advantage of the glass cover is more floor space. You can walk over Whyte’s diorama, since the glass is part of the floor. Goldfinger, on the other hand, has to be careful he doesn’t take a misstep and fall onto Fort Knox. The diorama in Diamonds are Forever is highly stylized, populated with miniatures of missiles, oil rigs, etc. which are almost toylike in their simplicity. Since the miniatures have to be recognizable from a distance, this visually reductionist approach works well. A ring of floodlights also helps ensure that everything is visible. 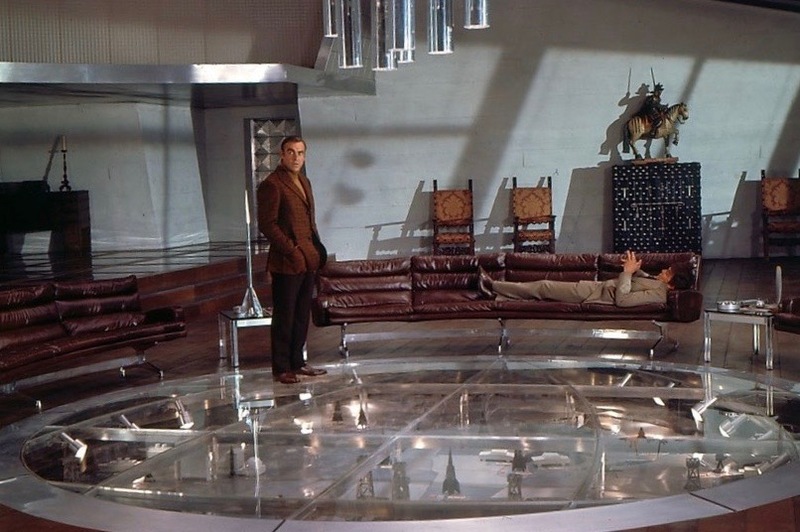 So striking is the diorama that it’s shown in nearly every shot of the film’s penthouse scenes. Cinematographer Ted Moore clearly recognized the value of Ken Adam’s contribution and leveraged it to the hilt.